Why are JFET transistors used in circuits with high input impedances? I read an introductory textbook to understand this but it doesn't tell the reason behind it. Is that because the JFETs require much less voltage to operate comparing to BJTs and one needs to drop voltage at the input? I'm a bit confused. The gate to source impedance is naturally very high with these components - you can think of it a bit like squeezing a hose to stop the water flow - there is no actual current/water flow into the "hose". 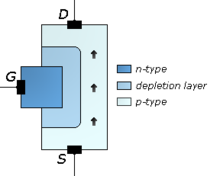 A JFET is a depletion device - it starts out with a low resistance between drain and source, and then the gate-source is reverse biased to turn the FET off. Since the gate-source is basically a diode, you have almost zero current flow (just a bit of capacitance to charge up) With a JFET, if you foward bias the gate the impedance will be low, just like a normal diode. With a MOSFET you can have both depletion and enhancement devices, due to there being a layer of oxide in between the bond and the substrate. 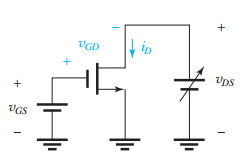 This means the impedance is high no matter which way you bias the gate, since there is no DC connection between the gate and channel. The input impedance at the gate can be 100s of Megaohms, again a small capacitance is present which needs to be charged up in order to switch the MOSFET on. Now in a perfect world the FET has an infinite input impedance. This of course is impossible, but it's not unrealistic to find an impedance of hundreds to thousands of megaohms. 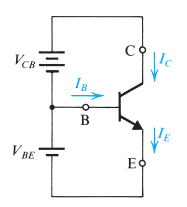 In comparison, the current through a BJT means that the impedance will be in the KΩ to MΩ range. The basic JFET is having a diode like input. This input is like a diode which is reverse biased. Contrast this with the BJT. There you have a PN junction which is forward biased. Hence, a BJT is current controlled , where as a n FET is voltage controlled. Naturally, you know that a reverse biased diode junction is like a open circuit, showing ideally infinite impedance. So, the reverse biased gate input of the FET is the cause of its high input impedance. Not the answer you're looking for? Browse other questions tagged jfet or ask your own question. How can I make a simple voltage-controlled attenuator? How to correctly wire LF356 JFET Opamp as amplifier? For the same JFET why are there two curves in a Transfer characteristics graph?